Dinosaur candy is an excellent candy for kids! Dinosaurs have long fascinated growing minds. There is a thrill children feel when they think about these massive animals that once roamed the earth. Children feel the tingle of a great mystery when they observe dinosaur bones placed together to form gigantic monsters in museums. And they feel wonder when they think of how these great animals could have suddenly disappeared. While theories abound as to how dinosaurs came to exist and how they ultimately became extinct, one cheerful theory is that they were simply placed on earth to fascinate young minds with their sheer awesomeness. It is also quite possible that dinosaurs were simply placed here to provide a delightful shape for candy. Our Dinosaur Bite candy is the perfect candy for children fascinated with dinosaurs. Our dinosaur candy is also perfect for children who may be slightly afraid of dinosaurs but would eat rather eat a dinosaur than have a dinosaur eat them! Our candy comes in various types and flavors perfect for any child. Our dinosaur bite candy is a crunchy, sweet candy that comes in assorted peach and grape flavors. They are on sale for twenty-five cents a pack. This candy is also fat free. We also offer dinosaur gummy candy. This delicious candy comes in a cherry flavor and contains seven yummy bites in every bag. It can be purchased on sale for only thirty-five cents a bag. It is also a fat free candy. Both of these wonderful candies would make a perfect addition to a dinosaur themed birthday party. They also make great counter stock for retail establishments looking to increase their impulse purchases from their customers. Who couldn't resist chomping on a crunchy or chewy dinosaur after stocking up on gasoline or groceries? This prehistoric candy is also perfect for teachers looking to sweeten the deal on science units. Teachers can deliver lessons on dinosaurs while also providing their students with a sweet treat. Our crunchy Dinosaur Bite candy can also be used in math lessons to teach graphing or probability. A teacher can simply instruct the students to sort out their Dinosaur Bite candy into two piles. One pile will be the fantastic grape flavor. The other pile will be the dynamic peach flavor. Students can then create a bar graph to represent the amount of peach and grape flavors contained in each bag. They can then compare and contrast their graphs with the other students in their class. Once this is complete, students can place the candy back into their bags and perform probability experiments to see if they are more likely to pull a grape or peach flavored dinosaur. Students can compare and contrasts their results and see how their dinosaur candy distribution graphs compare with the results of their probability experiments. Of course, the best part of this activity is that the ending will be absolutely delicious! 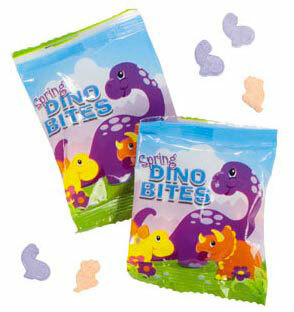 Consider purchasing some dinosaur shaped candy for your birthday party, classroom, or child today!